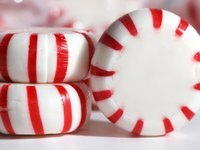 Most people come into contact with peppermint via mints, candy canes, herbal tea, and various oral hygiene products such as tooth paste and mouth wash. Peppermint extract, composed of peppermint oil mixed with alcohol, serves many purposes including cooking, baking, deterring nausea and helping keep your house clean. Peppermint makes a delicious addition to many baked goods and beverages. Take a cue from popular casual dining establishments and add a few drops of peppermint extract to your hot chocolate or make peppermint ice cream. You can use peppermint extract in place of vanilla extract in most recipes such as cookies and cakes. Traditionally, peppermint and chocolate make a popular pair so you may want to focus on adding peppermint to your favorite chocolate desserts. Peppermint extract serves many homeopathic purposes including soothing nausea, tooth aches, and menstrual cramps. A whiff of peppermint extract can help ward of nausea and motion sickness. Peppermint acts as a mild anesthetic and anti-inflammatory due to its high concentration of menthol. Menthol is a popular ingredient in topical pain relievers such as muscle rub. If you plan to take peppermint extract on a long term basis speak to your doctor. Peppermint is not FDA approved to treat any medical conditions. Peppermint's antiseptic properties make it an effective cleaner. You can add peppermint extract to home made cleaning products to gain peppermint's anti-bacterial effects and pleasant aroma. You can even clean your home by making a mixture of 2 tsp. of peppermint extract and about 1 cup of water to use in place of commercial spray cleaners.